Installing and operating a window fan in your home can make a big difference in saving money while keeping indoor air refreshing and comfortable. Less costly than air conditioning, window fans help circulate cooler air and help save you money during the warm spring days. There are a number of benefits that come with having one or two, or several window fans in your home. First and foremost, they can help reduce energy costs by making air conditioning units more efficient. 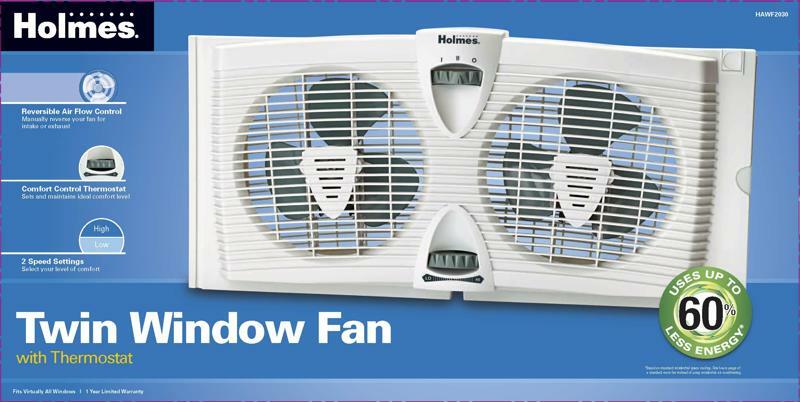 They don't require any tools and can be installed quickly and best of all, Holmes® Window Fans have been specifically designed to fit almost any kind of window. The primary benefit of a window fan is that it can be used to pull in cool, fresh air from the outside or, it can be used to exhaust stale indoor air. With an electronically reversible fan such as the Holmes® Electronically Reversible Twin Window Fan, you get the added bonus of one fan blade pulling in the fresh air and the second one blowing out the stale, indoor air. Additional features may also include thermostats, remote controls and temperature displays. These are great for providing optimal comfort as you have the ability to customize settings according to your schedule and room temperature preferences. There are a few helpful do's and don'ts to know when it comes to proper use of window fans. Do use both in-blowing and out-blowing fans in your home to amplify air movement. Or even better, just get the Holmes® Electronically Reversible Twin Window Fan which can electronically reverse the direction of air flow with the touch of a button. Don't operate window fans in heavy rains or poor weather. If your Holmes® window fan gets wet - although they are resistant to light rain - allow it to dry completely before plugging it back in again. Do unplug your window fan before cleaning. Use a damp cloth to wipe down dust and the brush attachment of a vacuum to get any dust that has gathered. Don't place the internal adjustable extender panel when installing your Holmes® window fan - it should always be at the top. Do close the window holding the fan as tightly as possible. This will prevent local circulation. Don't forget about Slider Safe® extender panels that come with Holmes® window fans! These allow for a better fit and added stability when using the fan in the vertical position. Do make sure that screens (if applicable) in windows with fans aren't missing or ripped. They should be strong and sturdy.